We call on you to ensure that planning permission is denied for Cuadrilla’s proposed fracking sites in Lancashire. This decision will not only have implications for the safety of the people and the environment of Lancashire, but for the whole country. In less than 48 hours we can win a key battle. New York has just banned fracking, saying the danger to public health is simply too high, but George Osborne and his cronies in Big Oil want to roll out fracking across the UK - even drilling under our homes and leaving toxic chemicals in the ground. Fracking for shale gas will not only lock us into a future of climate-changing fossil fuels, but it could have other devastating effects as well -- health experts have warned it could poison our water supplies and pollute the air. But we have a plan to stop itin its tracks. Fracking companies need permission from local councils to start drilling, and Lancashire County Council is set to make the first decision this week. 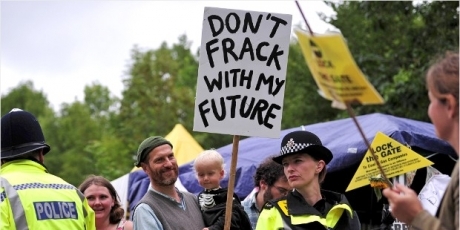 A fracking rejection here could stop fracking proposals across Britain. Pressure from the industry is fierce, but local planning officers have just recommended refusal -- and if enough of us call on Lancashire County Council now to keep Britain frack-free, we can kill off this health risk. Sign here and share with everyone!